BLEED LIKE ME is the kind of book that stays with you for a long time. BLEED LIKE ME is the kind of book that squeezes your heart and leaves you breathless. BLEED LIKE ME is the kind of book that makes you want to reach out and change the course of the story, but you know you can’t because it’s Gannon and Brook’s story. It’s so completely theirs that you have a feeling you’ve met them before after you close the book. And you wonder if you couldn’t have done something to reach out to them. From the author of Fault Line comes an edgy and heartbreaking novel about two self-destructive teens in a Sid and Nancy-like romance full of passion, chaos, and dyed hair. 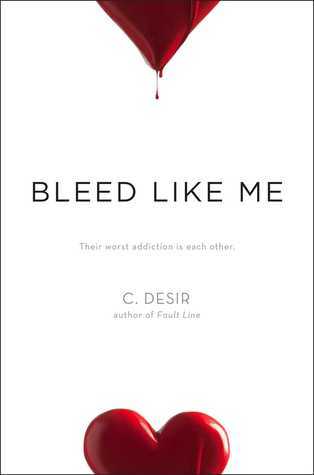 Bleed Like Me is a piercing, intimate portrayal of the danger of a love so obsessive it becomes its own biggest threat. Summary: Seventeen-year-old Amelia Gannon (just “Gannon” to her friends) is invisible to almost everyone in her life. To her parents, to her teachers-even her best friend, who is more interested in bumming cigarettes than bonding. Some days the only way Gannon knows she is real is by carving bloody lines into the flesh of her stomach. Then she meets Michael Brooks, and for the first time, she feels like she is being seen to the core of her being. Obnoxious, controlling, damaged, and addictive, he inserts himself into her life until all her scars are exposed. Each moment together is a passionate, painful relief. But as the relationship deepens, Gannon starts to feel as if she’s standing at the foot of a dam about to burst. She’s given up everything and everyone in her life for him, but somehow nothing is enough for Brooks-until he poses the ultimate test. This is one intense read and one I totally immersed myself into. I became the Ali to Gannon wanting to know more, wanting to help her, wanting to reach out to her but not knowing how. Disclaimer: I think Christa is awesome. Because she is. However, this review comes from my experience from reading her book. I´ve read this book in the laundry room of my hotel, and I´ve never wanted to do laundry as much as these past days, because I knew this was going to be my Gannon time. However, it is not an easy read and I had to pull myself out of the pages sometimes, thankful and yet annoyed at the washer beeping. There are moments when I cringed, and when I cried and when I looked away from the page. Why? Because Christa’s writing is vivid and pulls you in the story. It’s a story I find no adequate words for, because in one way, it shows how easy it can be to fall into something that’s bad for you because it seems like for once “you” matter, because it feels like “you” have found an outlet, someone to share everything with…even though you end up bringing each other more down than anything else. Oh, and did I mention how vivid and breathtaking Christa`s writing is? “BLEED LIKE ME is the kind of book that makes you want to reach out and change the course of the story, but you know you can’t because it’s Gannon and Brook’s story.” <– Yes, this exactly! This book broke my heart, but was unputdownable in all the best ways. So happy for Christa!